Billy Urso, ‘19, watches the ball after shooting in a game against Ohio Wesleyan as Tristan Tillman, ‘20, leaps to block him. Urso has been called a “second head coach” by his teammates. 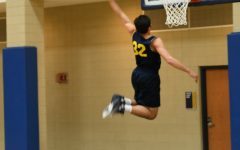 Allegheny men’s basketball is looking to capitalize on the talent of the first-year class and upperclassmen experience to improve its 7-11 record in the 2018-19 season. 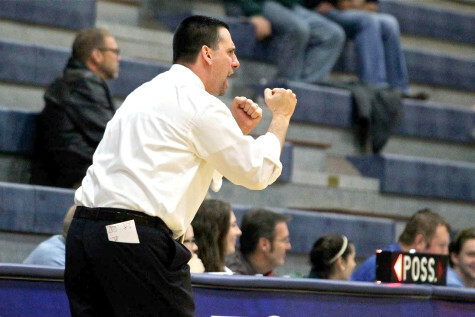 Head Men’s Basketball Coach Bob Simmons attributed some early season struggles, including a particularly close 71-77 loss to Ohio Wesleyan College, to adjusting to the rigor of the college athletics environment. The lessons taught to the younger players by the upperclassmen have paid off in recent games, according to Simmons. The Gators won three games in January, starting off the new year with a 66-57 win against Kenyon College. After a Jan. 9 loss to Hiram College, the Gators brought home victory again with a 98-95 victory over Dennison at home. The “little win streak” continued with a win on the road against Oberlin College. The Gators took home their first double-digit conference win in an 83-66 game. The Oberlin game also saw success for Forward Jordan Rawls, ’20, who scored his 1000th career point. Rawls attributed the team’s shared successes to becoming a more cohesive unit. Importantly, Rawls added, establishing this team dynamic meant bringing the youngest team members into the fold. 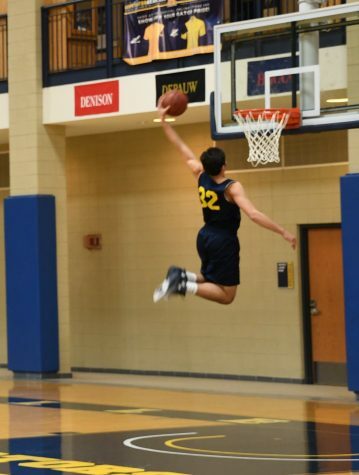 Caden Hinckley, ’22, said his first basketball practice at Allegheny was like being hit by a wall because so much information was thrown at him. “Throughout the season, it’s becoming easier and easier and I think that’s part of why we’re on this little win streak is because the freshmen (have) finally got a hang of how we have to play and how we have to practice day in and day out,” Hinckley said. 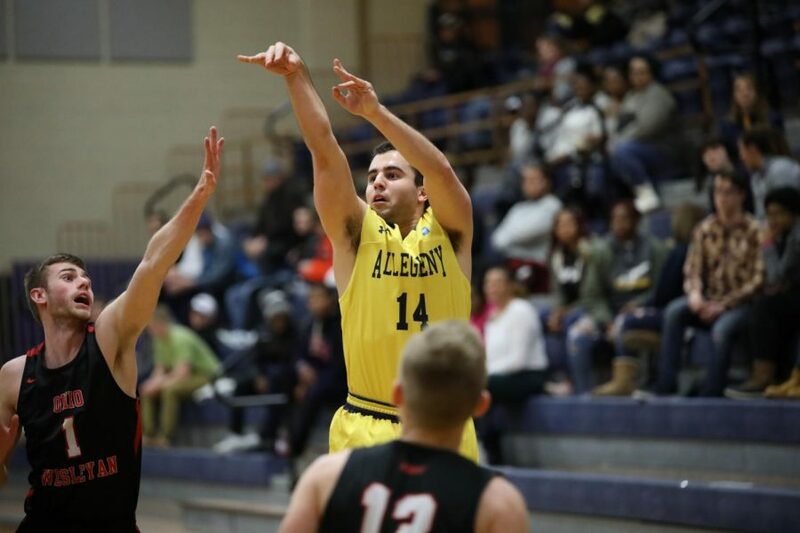 Hinckley and Rawls highlighted the success of several teammates, including freshman point guard Brian Roberts Jr., who has scored 276 points thus far in his first season at Allegheny. Billy Urso, ’19, is one of the upperclassmen helping to make Roberts’ and other first-years’ success possible, according to Hinckley. Hinckley said the playoffs are particularly close to Urso’s heart. “(With) every win we creep closer to getting our own home playoff game,” Hinckley said. Having enough success to get a home playoff game is an important goal for the Gators, who want to improve upon previous seasons. 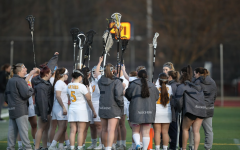 Allegheny’s 2-16 conference record places them in eighth place within the eight-team NCAC conference. Simmons is focused on his team’s improvement and successes. Simmons said three days of lifting in the off-season and six days a week total has paid off for each and every one of his players. Most importantly, according to Simmons, the team culture has been ready-made to cultivate success for upperclassmen and first-years alike.